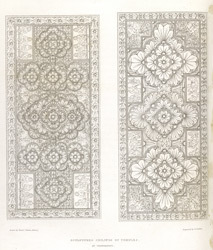 Etching of the sculptured ceilings of temples at Chandravati by Edward Francis Finden (1791-1857) and Ghasi (fl. 1820's). Plate 13 of the 'Annals and antiquities of Rajast'han or the Central and Western Rajpoot States of India' published in London in 1832.